Plane tickets: today, they have become more than common among consumers. But the pressure on airline companies is bigger than ever. A lot can go wrong – from technology-based delays to hurricane-induced cancellations. And whenever small- or large-scale disasters occur, customers grab their cell phones to talk about it – not to a robot, but to someone of the flesh-and-blood kind. In such cases, the airline or travel agency who is nicest to them wins their love and loyalty. The question is: How do you commit to your customer to win their lifelong devotion to you? We’ll be short on this one: you need a system that provides insight into issues and ensures that customers are kept abreast of the current state of affairs. Let them know how long they’ll still have to wait, what aircraft is available, or what the status of their complaint is. “Easier said than done,” you say. But we beg to differ. Because digital dynamic communication screens make it a piece of cake. Both within your organization and in airports, they provide travelers with all the information they require. The result? You’ve turned a disadvantage into an advantage. Next time, your well-informed customer will remember how you’ve helped them in their most difficult hour, and they will choose you again. 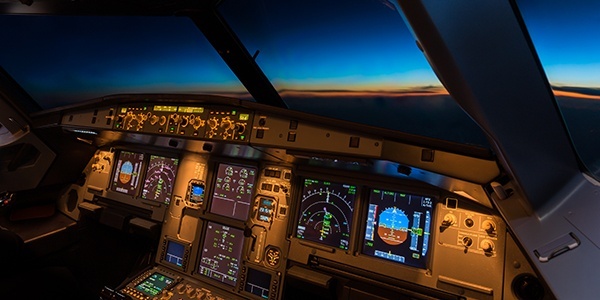 Visual Management: be like a pilot! Let’s dive into an aircraft’s cockpit for a minute. It has millions of components that are organized into different compartments which the pilot can monitor. This allows for an interaction between the pilot and their subsystems. Although it may seem like a world apart, Visual Management is not that different. You can examine how the real-time system’s compartments work, identifying critical factors and consolidating many data at a visible and well-fathomable level. It is possible to map out complex processes on a screen in a simple way. By providing and maintaining an overview, you remain the system’s pilot: the manager who supervises people, products, and systems. Important system hitches are pointed out in a timely manner, preventing them or minimizing their impact. In other words, your work process always continues, and you can serve your customers the way they want to be served – with love. The best part: you’ll receive their loyalty in return! Want to step into the cockpit of customer loyalty? Want to benefit from real-time communication between computer operations staff, helpdesk employees, and end users at any time? With QuickCOM and VitalCAST, we can disclose your systems and transform data to understandable information, quickly and in real time. Please don’t hesitate to contact us. We’d be happy to perform a Quick Scan and discuss your Visual Management opportunities.